Perhaps you’ve recently been diagnosed with a brain injury. Whether you have sustained a concussion in a car accident, a blow to the head, or some other type of traumatic injury, you have found yourself getting treatment. Yet, despite the care your doctors have offered, you find you’re losing focus at work, suffering from a lack of energy, and exhausted and sleep deprived. You know you have a brain injury, but suspect there may be something else wrong – is a part of the picture still obscured? It is very likely you are suffering not simply from a brain injury, but also an injury to your pituitary gland, an injury known as hypopituitarism. 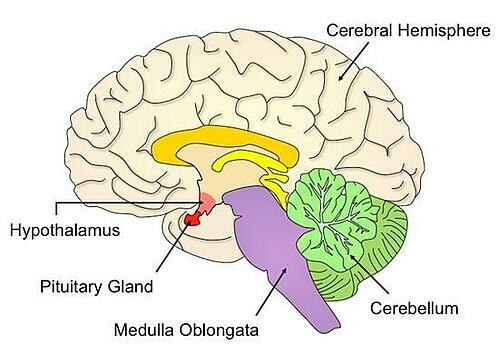 The pituitary gland is a small gland that sits in a bony hollow at the base of the skull, underneath the brain at the end of the hypothalamus, which controls the activity of the gland. Think of the pituitary gland as the “master” of the brain – the hormones it produces control and regulate a multitude of bodily functions. It can secrete hormones that affect other cells directly, or secrete hormones that impact other glands such as the adrenal or thyroid glands. The pituitary gland plays a vital role in balancing out your bodies systems, and an injury to the pituitary can affect the body in a multitude of ways. How is the Pituitary Gland Damaged When Your Brain Is Injured? Think of the pituitary gland as a cherry, and the hypothalamus as the stem. When you sustain a traumatic brain injury, such as a whiplash type injury where your head and neck can be violently jerked back and forth, the pituitary and hypothalamus are subject to stress in the same manner the stem and the cherry would be. If that connection with the hypothalamus is frayed, the resulting pituitary gland damage can alter the regulation and distribution of hormones to the rest of the body. This is why it is important to understand the difference between general traumatic brain injury symptoms and hypopituitarism symptoms. It should come as no surprise that traumatic brain injuries are frequently under diagnosed in emergency room settings and underreported in general. On top of this, research has shown that between 30-50% of people suffering from a traumatic brain injury also suffer from a pituitary injury. While not all brain injuries necessarily result in pituitary damage, statistics indicate there is a significant and drastic percentage of patients who need medical attention they are simply not receiving. Only recently have medical professionals started to look at patient’s needs systematically to determine how a brain and pituitary injury can be caused by the same trauma, how their symptoms can interact and, most importantly, how treating one can relieve the symptoms of another. For the last thirty years or so, endocrinologists have suspected that traumatic brain injuries were linked to pituitary damage. However, it is only over the last 12-15 years that endocrinologists and neurologists have begun to work together to combat these interconnected systems. By treating these symptoms as a result of a potential hormonal deficiency or imbalance, patients are finally getting care that allows them to return to their pre-injury selves. Doctors and scientists continue to explore the link between the pituitary gland and brain injury, and are changing the way traumatic brain injury cases are diagnosed, analyzed, and treated. Studies of children who suffer TBI suggest they should be subject to a pituitary screening within six months to determine if hormone therapy is needed. The United States Department of Defense has begun exploring the link between brain and pituitary damage in veterans, to determine if hormone replacement may help them. The NFL has even noted the high level of pituitary damage to those players suffering from traumatic brain injuries. Learn more about how brain damage became linked to pituitary gland injuries and diagnosing hypopituitarism. Do You Have a Pituitary Injury? If you believe that you have a pituitary injury, or have been diagnosed with a brain injury but are still suffering from the hypopituitary symptoms listed above, consult your doctor. It may be necessary for you to undergo a series of tests to determine if your body is secreting and regulating hormones in the manner it should. If you do have a pituitary gland injury, it may require the marshaling of resources and medical care from a variety of health care professionals who treat your injury systematically in order to get the required care. Consider consulting a personal injury attorney who is comfortable with and keeps abreast of the latest advances in how these injuries are treated, and who can help you in obtaining the care you need to get you back to feeling like yourself.